The answer is in the health benefits…and I think in the taste too…but more importantly, the nutrition and health benefits. The kind of broth that we are talking about here is your great grandmother’s broth. It was nutrient dense, delicious and gelatinous like yummy meat jello! It was an excellent source of minerals and was known to boost the immune system. You know how we all know to give someone soup when they aren’t feeling well? The reason for this is because back in the ‘nutrient dense’ day of real food, the broth for soup was made at home with the bones of animals and was full of minerals and nutrients that were necessary for healing. We still give people soup when they are sick because of this tradition, but they aren’t really getting the same healing benefits when the broth is out of a can or made up of water poured on chemically laden cubes of processed crap. The health benefits go beyond helping you to feel better when you have a cold or the flu. 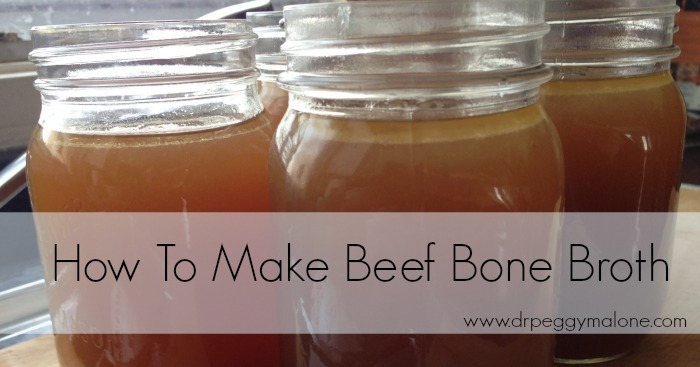 Because bone broth is full of collagen, it’s great for your joints, skin, hair, and nails. 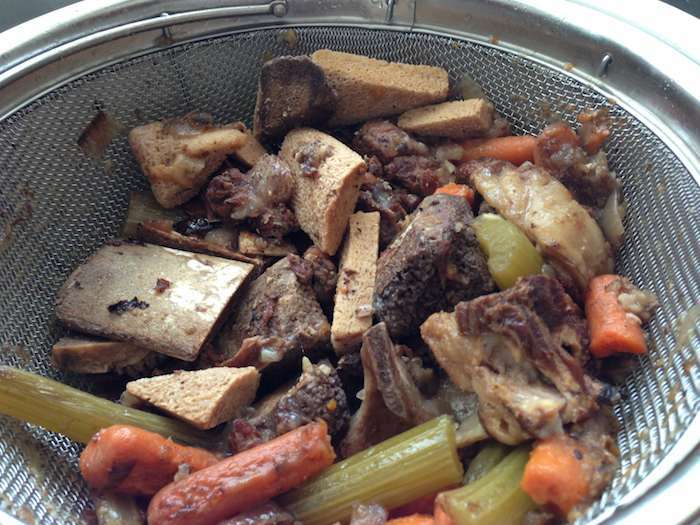 Bone broth can also aid in healing your digestive system and can help with allergies. 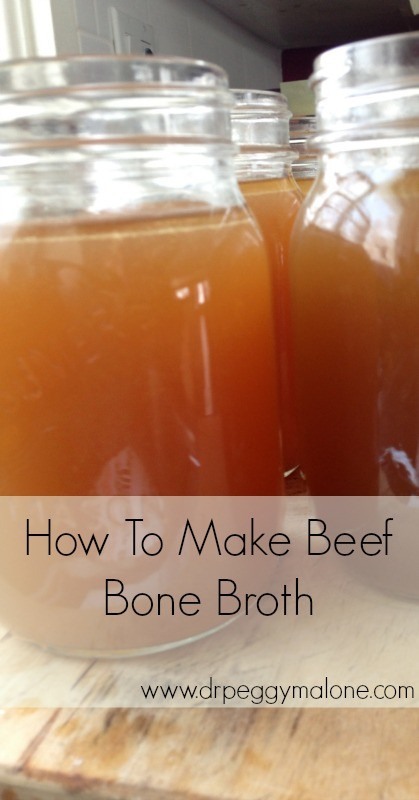 I make a batch of this healing bone broth every week in my slow cooker and it is so good! 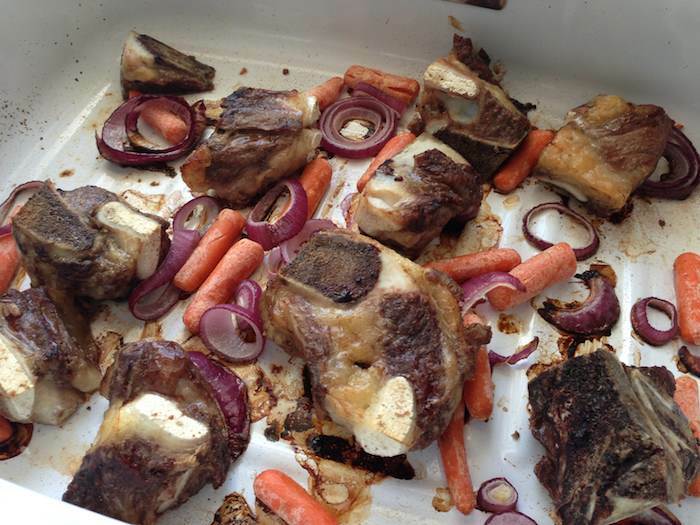 -Place the beef bones into a roasting pan with onions and carrots and roast at 450 degrees for 30 minutes, turning once at 15 minutes. Pour the mixture through a strainer to separate the broth from the solids. -Pour the mixture through a strainer to separate the broth from the solids. Use the broth in recipes for soups and stews or just heat it and drink it on it's own. It's so good for you!! Do you use organic meat? 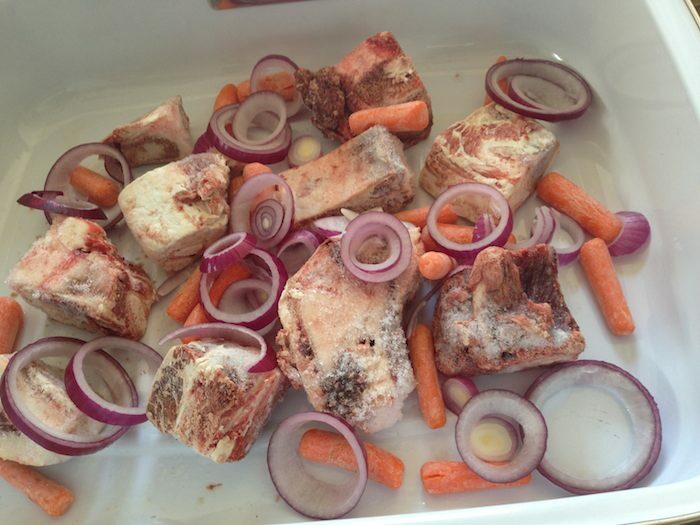 How do you use the beef bone broth? I do use bones from organic and grass fed beef but you don’t have to…you will still get great health benefits from using the bones from conventionally raised animals. As for how I use the broth….I make soup with it every week, I use it in any recipe that calls for stock and I drink it (about a cup per day)! I make this broth often. My favorite things to do with it is to make straciatella soup with it, which is an Italian egg drop soup with spinach, or French Onion Soup. Remember to use pastured eggs and organic spinach or onions. THe taste is stellar! My syntax was horrible in that last post, but I was passionate at the time. You get my drift. How much does this make and how long will it last in the refrigerator? Since I would be putting them in a Mason jar, it would be nice if the broth had a canning method to preserve longer. If you won’t be using the broth within a week you should freeze it. I usually freeze in 3 cup increments in freezer bags (make sure the broth is cool when you put it in the bag) I know that you can freeze mason jars as well but some people say you can get breakage of the jars which is why I stick to freezer bags for freezing. You could definitely also preserve the broth by traditional canning….but that’s a subject for another day. If you won’t be using the broth within a week you should freeze it. I usually freeze in 3 cup increments in ziploc bags (make sure the broth is cool when you put it in the bag) I know that you can freeze mason jars as well but some people say you can get breakage of the jars which is why I stick to ziploc bags for freezing. 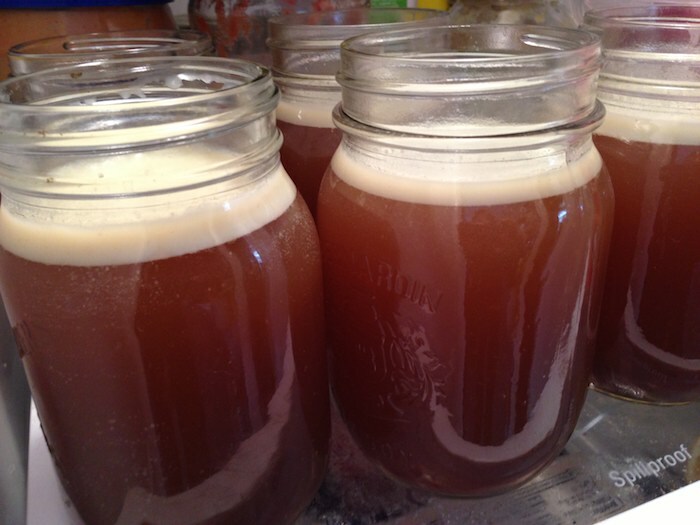 You could definitely also preserve the broth by traditional canning….but that’s a subject for another day. 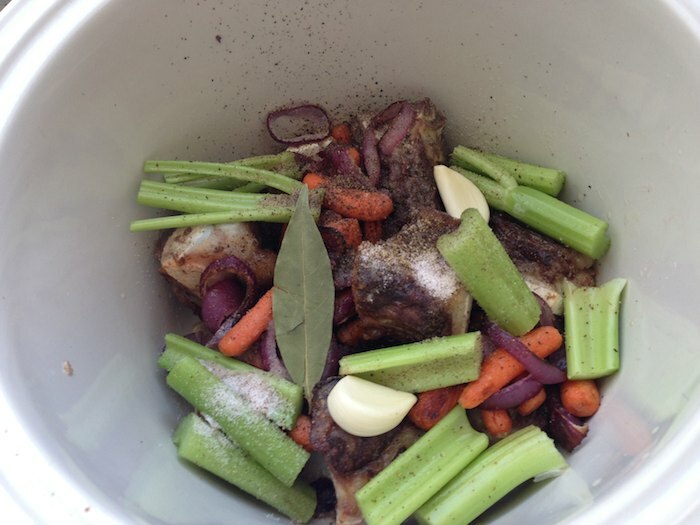 Do you have a re pie for chicken bone broth? Is this broth also suitable to pout on a dog’s meal? Hi Virginia, I can’t say for sure because the diet of dogs is not really in my wheelhouse but I assume it’s probably ok as long as your dog can tolerate all of the ingredients. I would ask your vet if you want to know for sure.